If you're looking to lose weight, it's time to skip the cold cereal and start enjoying a comforting bowl of oatmeal in the morning. It's the perfect breakfast for Fall! 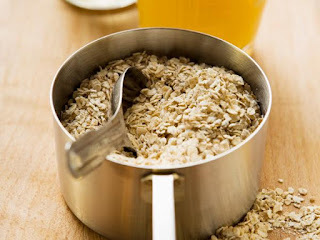 A small study found that those who ate oatmeal daily for six weeks had a greater decrease in cholesterol levels and waist size than those who ate the same amount of carbs in noodles over the same time period. It's proof that you can have your carbs and eat them, too! There's no need to reach for an unhealthy convenience snack in the morning when you've got oatmeal on your side; it offers the calories and fiber you need to stay satisfied all morning long. Unlike sugary breakfast cereals full of refined carbs, the body digests oatmeal at a slower pace, keeping blood sugar levels steady, energy up, and hunger away. When it comes to weight loss, celebrity trainers Bob Harper and Gunnar Peterson agree: you should eat carbs for breakfast. According to Manhattan-based nutritionist and registered dietitian Shira Lenchewski, "[carbs] are burned more efficiently in the morning than at night," so they don't go unused and get stored as fat in the body. Shira also recommends that the largest meal (higher in carbohydrates) be breakfast. Rolled oats take well under 10 minutes from prep to bowl. It might be a little more time than that instant packet you're used too, but these varieties don't come with any added sugars often found in those flavored packets. Or there's always the option to go with overnight oats that require just a little prep the night before and are ready to eat from the fridge the next morning. This warming breakfast should never feel boring or blah. Liven up your oatmeal bowl with these healthy combinations that keep your meal feeling fresh, filling, and satisfying to your taste buds, too.